An editorial in the New York Times says Interior Secretary Ken Salazar is going to "create new regulatory hurdles" to prevent mining on federal lands in northern Arizona. It is unclear whether this information comes from Mr. Salazar or the Times is simply repeating the wishes of anti-mining advocates. At the Grand Canyon last week, Salazar said the 20-year moratorium he is imposing on exploration and development on 1 million acres of federal lands would not affect existing claims established prior to his withdrawal of lands two years ago. However, the Times editorial suggests the Interior Dept. is going after those prior rights. Anti-mining forces have pushed Interior to change the rules on mining claims so that exploration would not be allowed unless a company could prove before the fact that economically-viable mineral resources exist. Such an action would have widespread implications well beyond the Grand Canyon region and uranium mining. Since discovering the resource is the purpose of exploration, it would de facto shut down exploration and subsequent mining on federal lands. Mr. Salazar said he could not cancel valid existing claims, but there is likely to be little actual mining. The decision to “withdraw” the land from future claims creates new regulatory hurdles for existing claimants, who must demonstrate, among other things, that they had discovered actual mineral deposits before the 2009 moratorium. Only a handful have been able to do so. 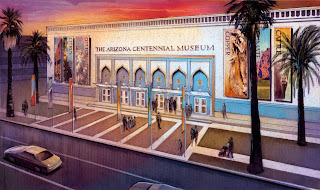 Supporters of the former Arizona Mining & Mineral Museum are "lawyering up" to prevent conversion of the facility into the Arizona Experience centennial musem, according to a story in the new issue of Phoenix Magazine. 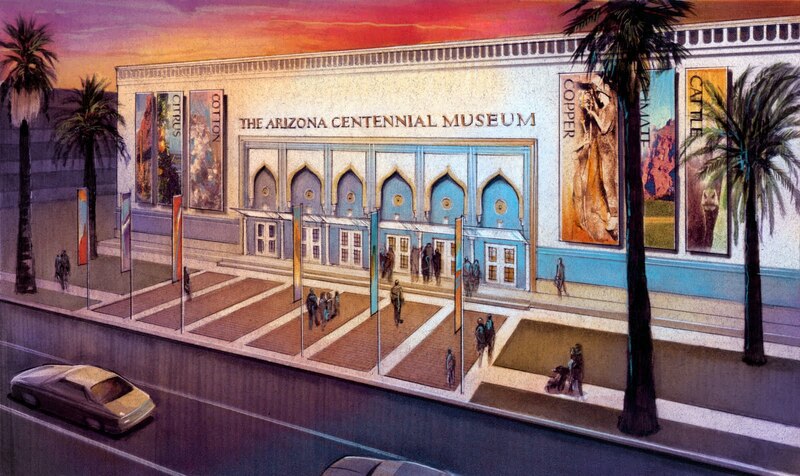 Reporter Dolores Tropiano doesn't go into detail but says opponents of the centennial museum [right, credit, Arizona Centennial Commission] "want to stop construction of the new museum through legal action, turning public opinion against it and drying up contributions." She opines that for some, "recent happenings at the Arizona Mining and Mineral Museum in Downtown Phoenix have been as polarizing as a certain local sheriff." Summer has settled into southern Arizona with a vengeance. Temperatures are reaching 105-110F every day with the sun blazing in clear skies. Fortunately, the winds have eased, allowing firefighters to make progress in containing record wildfires across the region. The local wildlife around our house in the Tucson Mountains, backing up to the regional park, have again discovered the 40 square feet of grass we maintain out back. The squirrels, chipmunks, and rabbits spread out belly down in the cool grass and dig shallow burrows into the soil in the late afternoon. A few days ago, my wife Ann caught this shot of a bobcat who took over for a while. 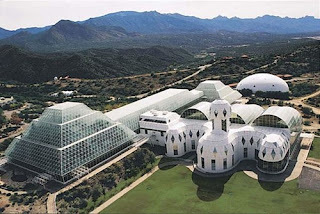 correction 6-26-11: I initially said Texas oil billionaire Ed Bass will donate the Biosphere 2 complex to the University of Arizona next week. In fact, Biosphere 2 is owned by CDO Ranching and Development Co. which is making the donation of the facilities. Ed's foundation is providing $20 million for operations. The UA College of Science will receive 40 acres around Biosphere 2, including a conference center and a collection of casitas. Bass’ Philecology Foundation will also give the UA a $20 million grant to cover the cost of running the facility in future years, according to UA sources. The U.S. Dept. of Interior posted a video of Sec. Ken Salazar's remarks at the Grand Canyon last week, calling for a 20 year ban on exploration and mining on 1 million acres of federal land in northern Arizona. The Kingman (AZ) Daily Miner newspaper is running a poll on reaction to Interior Secretary Salazar's ban on mining on federal lands in northern Arizona. While the issue has been framed in the news media as a choice between saving the Grand Canyon or poisoning the drinking water of 25 million people, the issues are more complex than that. The case was filed by Save the Scenic Santa Ritas, Farmers Water Co. and others. 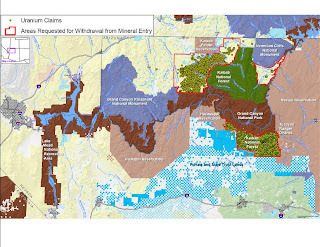 Defendants include the U.S. Forest Service, Rosemont Copper, Arizona Mining Association and other mining interests that have joined the suit to support the Forest Service. The plaintiffs allege the Forest Service violated the Federal Advisory Committee Act by allowing Rosemont to participate in meetings of cooperating government agencies, but the government maintains that FACA does not apply to cooperating agency meetings. The plaintiffs argue that the Forest Service violated the Freedom of Information Act but says it has complied with FOIA after posting numerous Rosemont-related documents on its web site. AZGS is one of the cooperating agencies and attended many of the meetings where someone from Rosemont Copper was present. Sometimes Rosemont was there to make presentations. Other times it was to answer questions or to respond to requests from agencies. The Save the Scenic Santa Ritas group is planning to protest outside the courthouse on Monday. The DOE webinar on Geothermal Heat Pumps that was run on Thursday, will be posted online for viewing along with the collection of other webinars in the DOE programs. The Heat Pump webinar offered a basic intro to the concept, with a detailed case study. In the meantime, here is a short video entitled Energy 101: Geothermal Heat Pumps. AZGS is the prime contractor to DOE on adding data from all 50 states to the National Geothermal Data System, including information on geothermal (or ground source) heat pumps. An Energy Report interview posted on Mineweb.com with Versant Partners Analyst Rob Chang says "in the long term, prices must rise due to a supply shortfall and the economic necessity of using nuclear power." NASA's Near Earth Object (NEO) program office stunned the astronomical world yesterday with news that a small asteroid will pass extremely close by Earth on Monday. From NASA-NEO: "Near-Earth asteroid 2011 MD will pass only 12,000 kilometers (7,500 miles) above the Earth's surface on Monday June 27 at about 9:30 EDT. The asteroid was discovered by the LINEAR near-Earth object discovery team observing from Socorro, New Mexico. The diagram on the left shows the trajectory of 2011 MD projected onto the Earth's orbital plane over a four-day interval. This small asteroid, only 5-20 meters in diameter, is in a very Earth-like orbit about the Sun, but an orbital analysis indicates there is no chance it will actually strike Earth on Monday. One would expect an object of this size to come this close to Earth about every 6 years on average. For a brief time, it will be bright enough to be seen even with a modest-sized telescope." However, Sky and Telescope magazine is suggesting that the object is in almost the same plane as the Earth and traveling with the same velocity. Could it actually be a rocket booster that broke out of orbit and is now just a bus-sized piece of space junk? Here are a collection of wildfire status links for Arizona. Candace Bogart, GIS Manager for the US Forest Service, briefed the Arizona Geographic Information Council's Data Committee on fire response efforts, including plans for high resolution aerial imagery to assess post-fire response and mitigation needs. What do you want commodity prices to do? Well, whatever it is, there is probably an analyst that will give you a way to rationalize your hopes. On Mineweb.com, RBC Capital Markets makes the case that there is a medium term production constraint that makes copper their preferred base metal. 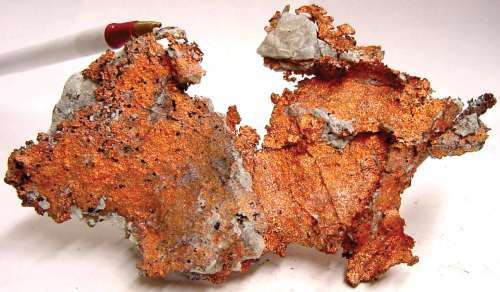 "The copper market remains tighter than the other base metals. Inventories are relatively low, there is little excess mine capacity, and utilization rates remain high, supporting strong pricing." A magnitude 3.3 earthquake [gold star in center of map. Seismicity 1990 to present. Credit USGS] occurred about 20 miles east of Fredonia, at about 8:14 pm local time tonight. The area has a history of scattered low level seismicity but this is one of the larger events in the region. As I write this, an hour after event, there are 2 reports of it being felt, by residents to the east. The hearing will begin at 10:00 a.m. on July 15, 2011, in room 321 of the State Land Department Building located at 1616 West Adams Street, Phoenix. The company plans on sending the carbon dioxide production from the field to New Mexico and Texas for use in enhanced oil recovery projects. The well spacing decision is a key step in development drilling and production. Is Arizona solar company mining its own Tellurium? Tempe-based First Solar corporation is the world's largest producer of photovoltaic solar panels, using thin-film technology based on cadmium and tellurium (Cd-Te). Recently, GE announced they will enter the same market. For the past few years, there has been rampant speculation about whether the world production of tellurium will be able to meet the needs of these solar manufacturers. 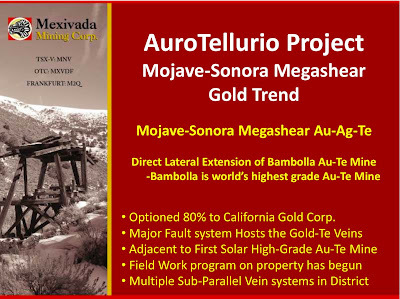 A 10K SEC document filed by California Gold Corp (CLGL:OTC BB) says, "Minera Teloro, S.A. de C.V.," which, to our knowledge, is a subsidiary of First Solar. 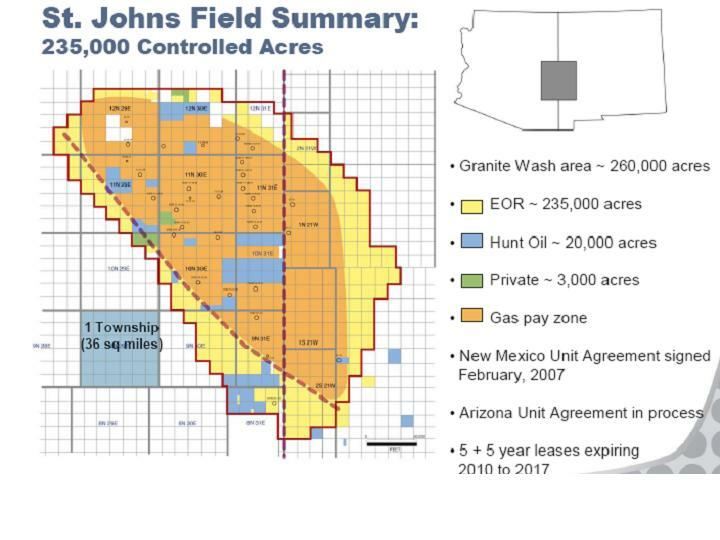 He also refers to the figure at right, from a presentation by Mexivada, that describes a mining property "adjacent to First Solar high-grade Au-Te mine." “The federal government today has involved itself in yet another instance of excessive and unnecessary regulation – this time potentially at the expense of hundreds of high-paying jobs and billions of dollars worth of revenue for the Arizona economy. “Secretary of the Interior Ken Salazar this morning announced that his agency’s ‘preferred alternative’ is that nearly one million acres of land situated near the Grand Canyon be put off-limits to uranium mining. This decision flies in the face of years of Arizona experience with uranium mining in northern parts of our state, where mining operations have been conducted responsibly and in accordance with federal and state oversight. In fact, both the Arizona Geological Survey and Arizona Department of Environmental Quality have submitted findings that uranium mining – conducted lawfully and with proper oversight – constitutes minimal environmental risk to the Grand Canyon and Colorado River. “If instituted, this uranium mining ban would deal a blow to future economic growth near the Grand Canyon, as well as our nation’s attempts to improve its energy independence. That’s because these sections of the Colorado Plateau contain the highest-grade uranium ore in the country. The responsible extraction of these deposits would assist domestic energy production and pump an estimated $10 billion into the local economy over the life of the mines, creating quality jobs in rural Arizona and tribal areas of our state hit hard by the recession. Simply put, today’s announcement by the U.S. Department of the Interior is scientifically unsound and economically unwise. MATHER POINT, GRAND CANYON NATIONAL PARK – In remarks regarding the potential withdrawal of certain federal lands near the Grand Canyon from new mining claims, Secretary of the Interior Ken Salazar today said that management of the Grand Canyon area must be guided by "caution, wisdom, and science," so as to protect the World Heritage Site, tribal interests, drinking water supplies, and the tourism economy that the area's natural resources support. 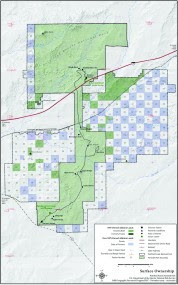 In his remarks, provided below, Secretary Salazar stated that he will take action to prevent the opening of one million acres of public and National Forest System lands surrounding the Grand Canyon to new uranium mining claims while the Bureau of Land Management (BLM) completes a final Environmental Impact Statement that evaluates a preferred alternative of a 20 year mineral withdrawal on those same lands. Secretary Salazar was joined at the Mather Point Amphitheater in Grand Canyon National Park by BLM Director Bob Abbey, National Park Service Director Jon Jarvis, and US Geological Survey Director Marcia McNutt. A fact sheet on today's announcement can be found here. Secretary Salazar's remarks as prepared for delivery are below. One hundred and forty-two years ago, John Wesley Powell and his crew became the first explorers ever known to successfully steer their way through the rocks and gorges, the rapids and whirlpools, of America's greatest natural wonder: the Grand Canyon. Powell came here to read the story of our planet in the layers of the canyon walls. He came to study the forces that shaped this land, pebble after pebble, flood after flood, over 2 billion years. To be here - for John Wesley Powell or for any of us - is to be overwhelmed and humbled by the scale of geologic time. The minutes, hours, and days by which we measure our lives are hardly an instant in the life of these canyons. Yet, all of us - by the decisions we make in our short time here - can alter the grandeur of this place. Our ancestors understood this. Time and again, people like John Wesley Powell, Theodore Roosevelt, and Stephen Mather (for which this point is named), helped us choose the protection of the ancient over the pressures of the now. As Teddy Roosevelt famously implored from this very place: “Leave it as it is. You cannot improve on it. The ages have been at work on it, and man can only mar it." That courage... that wisdom... that patience... is why we have Grand Canyon National Park, iconic places like Yosemite and Yellowstone, and wild and untrammeled forests and public lands for all Americans to enjoy and explore. Our ancestors could not have known that one day the Grand Canyon would attract more than 4 million visitors a year. That hunting, fishing, tourism, and outdoor recreation would generate an estimated $3.5 billion in economic activity in this area. Or that millions of Americans living in cities like Phoenix and Los Angeles would rely on this river and this canyon for clean, healthy drinking water. And many Tribes in the area see their history and culture woven throughout the Grand Canyon’s landscape. Like our ancestors, we do not know how future Americans will enjoy, experience, and benefit from this place. And that's one of the many reasons why wisdom, caution, and science should guide our protection of the Grand Canyon. In this moment, we face a choice that could profoundly affect the Grand Canyon in ways we do not yet understand. 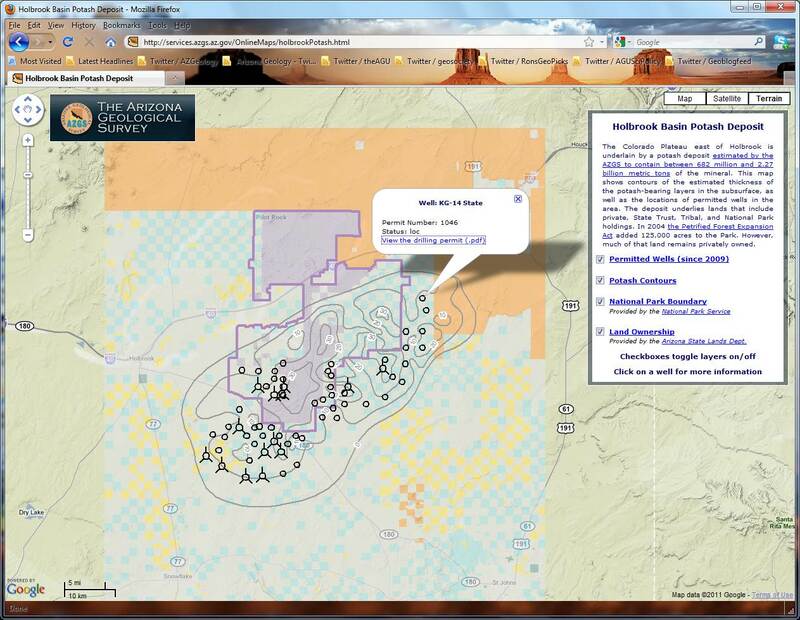 Some of the lands near the Grand Canyon contain uranium resources that have helped meet our energy needs. Over the past 20 years, eight uranium mines have operated in the area and one study has shown that a possible additional eight to eleven mines might be developed in the area. The question for us, though, is not whether to stop cautious and moderate uranium development, but whether to allow further expansion of uranium mining in the area. The Bureau of Land Management, under the leadership of Director Bob Abbey, has been carefully studying this question since July, 2009, when I initiated a two-year closure of the area to new uranium mining claims. BLM, in coordination with other agencies, the States, Counties, Tribes, and other partners published a draft environmental impact statement that examined whether to implement a twenty year mineral withdrawal, subject to valid existing rights, for certain areas around the Grand Canyon. 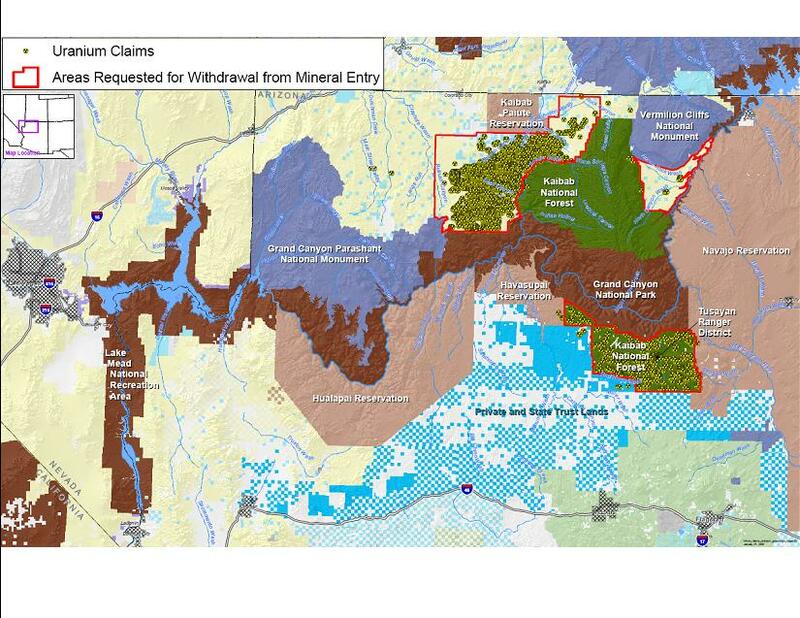 The options they considered were no withdrawal (which would allow new hard rock mining claims to be filed), a partial withdrawal of approximately 300,000 acres, a partial withdrawal of 650,000 acres, and a full withdrawal of approximately 1 million acres. The BLM received nearly 300,000 comments on this draft environmental impact statement. The time has now come to respond to those comments and identify a "preferred alternative" for a final environmental impact statement that the agency will complete by this fall. Based on the analysis that has been done and the public comments that have been received, in particular - many of the water quality concerns raised by downstream water users, I am directing two steps today. First, I am ordering a temporary emergency withdrawal - through December 20, 2011 - of the full one million acres we are studying for the potential long-term withdrawal, subject to valid existing rights. This emergency six-month withdrawal will ensure that no new mining claims can be filed after the current two-year segregation expires on July 20th. 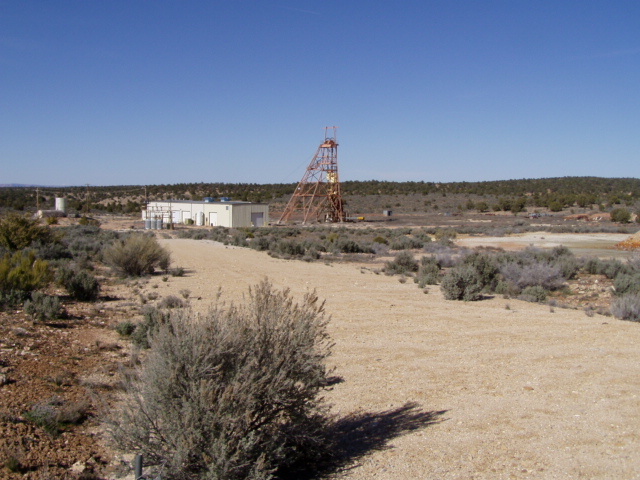 Second, based on the input of BLM Director Bob Abbey, National Park Service Director Jon Jarvis, USGS Director Marcia McNutt, and the United States Forest Service Chief Tom Tidwell, I am directing the BLM to identify the full one million acre uranium withdrawal as the preferred alternative in the final EIS. This alternative, if ultimately selected, would ensure that all public lands adjacent to Grand Canyon National Park are protected from new hard rock mining claims, all of which are in the watershed of the Grand Canyon. This remains an ongoing process. Based on this direction, BLM will complete the environmental analysis of the preferred alternative and other alternatives and publish a final environmental impact statement by fall 2011. I will then be ready to make a final decision on the potential 20-year mineral withdrawal. Finally, before I turn it over to Bob, I want to make a couple of things clear. First, I know some critics will falsely claim that with a full one-million acre withdrawal from new hard rock mining claims, we would somehow be denying all access to uranium resources. That, of course, is not true. Uranium, like oil and gas, solar, wind, geothermal, and other sources, remains a vital component of a responsible and comprehensive energy strategy. 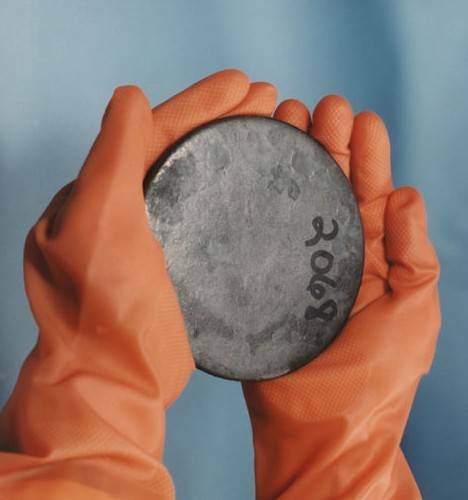 We will continue to develop uranium in northern Arizona, Wyoming and other places across the country. It is worth stating again that we believe there are likely a number of valid existing rights in the proposed withdrawal area even if the preferred alternative is ultimately selected as the final decision. We expect continued development of those claims and the establishment of new mines over the next twenty years. In fact, cautious development with strong oversight could help us answer critical questions about water quality and environmental impacts of uranium mining in the area. This science, derived from experience, would help others decide what actions are necessary to protect the Grand Canyon. Second, as we move through the final analysis toward a decision, let us all be reminded of what these canyons can teach us. It is what John Wesley Powell and his crew experienced here as they risked their lives more than a century ago. And it's what families sense when they stand on this rim: that our lives are fleeting instants when measured against the geologic time and forces that forged this canyon. But our decisions - our actions - can alter billions of years of history in all its wonder and glory. Let us be cautious. Let us be patient. Let us be humble. This morning, Secretary of Interior Ken Salazar will announce an emergency withdrawal of 1 million acres of federal lands in northern Arizona from mineral exploration and entry. The lands are under a 'segregation' order through July 20 while an EIS on mining is completed. The Secretary will also announce that the preferred alternative for the mineral EIS is one calling for a 20 year withdrawal of the full million acres from mineral activity, the most restrictive option under consideration. BLM and Park Service officials earlier this morning stated that evaluation of comments on the draft EIS are still underway but they had enough concerns over water quality and park values to make the decision before analysis of the comments was complete. A magnitude 2.0 earthquake struck just east of Boulder City in Arizona at 9:38 a.m. this morning. The larger area is subject to a low level number of small quakes. From the NASA Goddard Spaceflight Center website: In this image the Wallow Fire burn scar is red, ongoing fires are very bright red, smoke is blue, water is black and dark blue and bare ground is tan. This Landsat 5 image was acquired June 15, 2011. It is a false color image using ETM+ bands 7, 4 and 2. 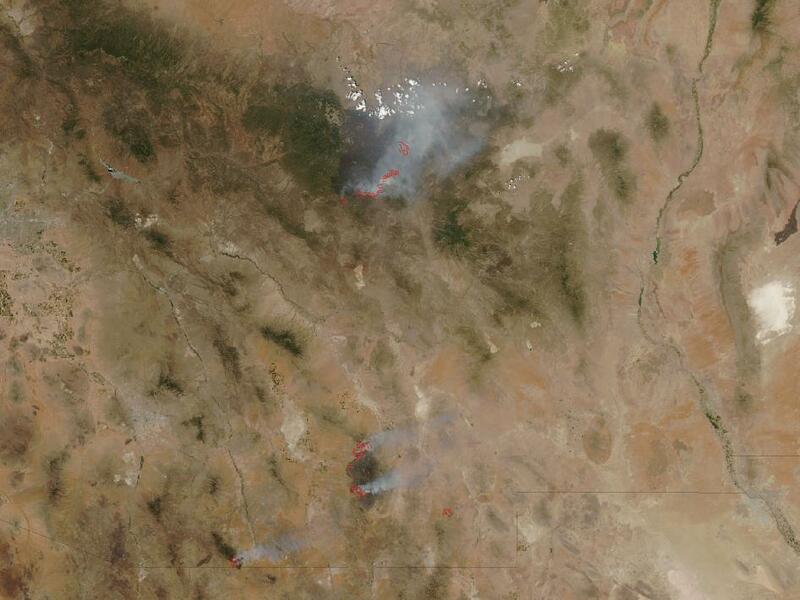 The Wallow Fire falls on Landsat WRS-2 Path 35 Rows 36 & 37. A video about the ASU School of Earth and Space Exploration, created by Erik Holsinger, director of video communications, titled: "SESE Beyond the Ordinary" won the CINE Golden Eagle Award in the Adult Education and Entertainment category. The SESE web site notes that the CINE Golden Eagle Film and Video Competitions, held each Spring and Fall, involve hundreds of media and content specialists who judge entries in several moving-image genres and acknowledge high-quality production in a variety of content categories for professional, independent and student filmmakers. The University of Arizona Dept. of Geosciences received a donation of $57,000 from ConocoPhillips. Of that, $50,000 is to support graduate scholarships, with the remainder going to GeoDaze and research support. This is the largest single donation the department has received, exceeding past corporate donations by at least $17,000. 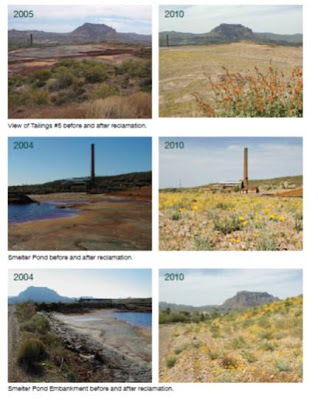 Another new USGS report describes their work that "developed a multitemporal land-use/land-cover dataset for the binational Santa Cruz watershed of southern Arizona, United States, and northern Sonora, Mexico by creating a series of land-cover maps at decadal intervals (1979, 1989, 1999, and 2009) using Landsat Multispectral Scanner and Thematic Mapper data..."
Villarreal, M.L., Norman, L.M., Wallace, C.S.A., and van Riper, Charles, III, 2011, A multitemporal (1979-2009) land-use/land-cover dataset of the binational Santa Cruz Watershed: U.S. Geological Survey Open-File Report 2011-1131, 26 p. and database. "Prior to the release, politicians and staff from the City of Prescott and Town of Prescott Valley did some arm-twisting through Rep. Paul Gosar's office, which gave them access to the report and the ability to make changes. Although some changes were made, Leenhouts has since stated that the changes were for clarification and did not affect the substance of the report or the model's ability to do the work it was designed to do. Nevertheless, the incident has been disappointing to several area leaders given the fact the USGS investigations are not typically subject to political review before being made public." Major results from the simulations include the importance of variations in recharge rates throughout the study area and recharge along ephemeral and losing stream reaches in alluvial basins. Insights about the groundwater-flow systems in individual basins include the hydrologic influence of geologic structures in some areas and that stream-aquifer interactions along the lower part of the Little Colorado River are an effective control on water level distributions throughout the Little Colorado River Plateau basin. Better information on several aspects of the groundwater flow system are needed to reduce uncertainty of the simulated system. Many areas lack documentation of the response of the groundwater system to changes in withdrawals and recharge. Data needed to define groundwater flow between vertically adjacent water-bearing units is lacking in many areas. Distributions of recharge along losing stream reaches are poorly defined. Extents of aquifers and alluvial lithologies are poorly defined in parts of the Big Chino and Verde Valley sub-basins. Aquifer storage properties are poorly defined throughout most of the study area. Little data exist to define the hydrologic importance of geologic structures such as faults and fractures. Discharge of regional groundwater flow to the Verde River is difficult to identify in the Verde Valley sub-basin because of unknown contributions from deep percolation of excess surface water irrigation. 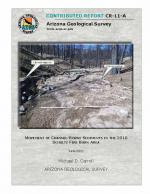 Pool, D.R., Blasch, K.W., Callegary, J.B., Leake, S.A., and Graser, L.F., 2011, Regional groundwater-flow model of the Redwall-Muav, Coconino, and alluvial basin aquifer systems of northern and central Arizona: U.S. Geological Survey Scientific Investigations Report 2010-5180, v. 1.1, 101 p.
This video from the Arizona (Flagstaff) Daily Sun, explains the shredding of burned or downed trees to make a mulch that is spread on the burned areas to reduce flooding and erosion that could lead to debris flows. Last year's Schultz fire in the mountains above Flagstaff offers lessons learned to the residents facing monsoon rains coming on the heals of the current wildfires. 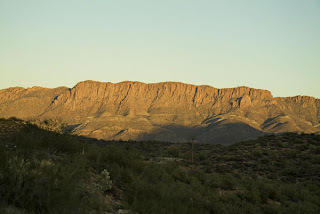 We live in the midst of the Tucson Mountains Regional Park west of town, surrounded by an abundance of Sonoran desert flora and fauna. My wife Ann, works from home and sees a continuing parade of critters coming down for a drink or shady place to hang out. One of her favorite online resources is Margarethe Brummermann's blog "Arizona: Beetles, Bugs, Birds, and More," subtitled "Adventures and observations of a biologist and watercolor painter in Arizona's deserts and mountains." Her photos are gorgeous and there are numerous links to help you figure out what you are looking at in your back yard or morning hike. AZGS geologists are working with our state and federal counterparts to assess the potential for post-fire flooding and debris flows. The Arizona Division of Emergency Management (ADEM) put out this announcement about the meeting of tribal, federal and state agencies to discuss potential post-fire flooding threats in communities impacted by the Wallow, Horseshoe Two and Monument fires earlier this week. Attendees discussed a number of issues, including the average monsoon rainfall in those area, the status of rain gauges and the utility of existing flood warning systems. Chief among them was the need for outreach to at-risk communities about the importance of being prepared and adequately insured. Agencies in attendance included the San Carlos Apache Tribe; the Arizona departments of Environmental Quality, Game and Fish, and Water Resources; the State Forestry Division; the Arizona National Guard; the National Weather Service, the U.S. Geological Survey, the Department of Homeland Security; FEMA; the federal bureaus of Indian Affairs and Reclamation; and the U.S. Forest Service. Data models created cooperatively by experts in such fields as hydrology, geology, forestry and civil engineering will be shared with at-risk communities. In turn, these communities will lead the planning for flood mitigation and response. Most homeowners’ insurance policies do not cover flood damage, but most agents who sell homeowner’s insurance also sell federal flood insurance policies. Detailed information about the National Flood Insurance Program (NFIP) is available online at www.FloodSmart.gov or with a call to the NFIP referral center at (888) 379-9531. It takes 30 days for an NFIP policy to go into effect. Although the flood risk of an area might increase, insurance premiums do not. Rates are based on flood maps that do not immediately change after a fire event. Home and property owners can learn their level of flood risk at www.FloodSmart.gov. Visit the Arizona Emergency Information Network (AzEIN) website at www.AzEIN.gov for real-time emergency updates, preparedness and hazard information, and multimedia resources. OFR-90-6-Controls on the Origin and Recurrence of Debris Flows in the Huachuca Mountains, Southeastern Arizona, by E.E. Wohl and P.A. Pearthree, 1990, 48 p.
OFR-08-08- Delineating Post- Wildfire Debris Flow Hazards for Pre-Fire Mitigation, Pine and Strawberry, Arizona: A FEMA 5% Initiative Study, 2008, 20 p.
DM-DF-1 Geologic Mapping of Debris-flow Deposits in the Santa Catalina Mountains, Pima County, Arizona. 2008, A. Youberg and 4 others, report and 11 map sheets. CR-11-A Movement of Channel-borne sediments in the 2010 Schultz fire burn area, 2011, by M. D. Carroll. 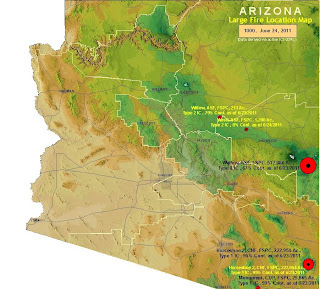 Recent Debris Flows and Floods in Southern Arizona, 2006, P.A. 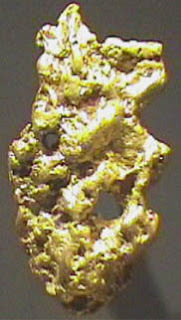 Pearthree and A. Youberg, Arizona Geology, V. 36, #3, Fall 2006. 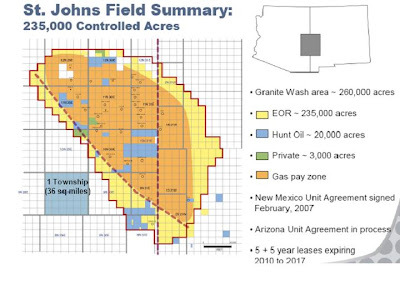 The Arizona Oil & Gas Conservation Commission (staffed by AZGS) approved 11 more exploration corehole permits for Southwest Exploration/Passport Potash this week. Nine wells are in Apache County, with two in Navajo County. There have been up to four drilling rigs at work for three companies exploring the Holbrook basin potash deposit. Late Friday afternoon, we were notified that Secretary of the Interior Ken Salazar will be at Grand Canyon National Park on Monday morning to make a major announcement. He will be accompanied by Bob Abbey, Director of the Bureau of Land Management, Jon Jarvis, Director of the National Park Service, and Marcia McNutt, Director of the U.S. Geological Survey. 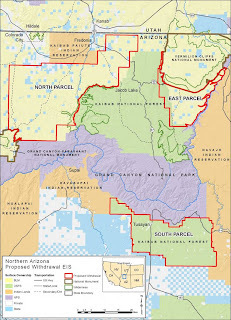 No further details were provided but there is speculation the announcement has to do with the expiration on July 20 of the two-year moratorium the Secretary imposed on exploration and mineral entry on nearly 1 million acres of federal lands, while an EIS is conducted on his proposal to withdraw the lands for 20 years. The EIS is still in process and the moratorium cannot be extended, thus creating the possibility that exploration could technically be resumed after July 20. The plant is located at the old limekiln towns of Putenney and Drake, that began in the laste 1800's. The draw is the exposure of Mississippian Redwall Limestone in Hell Canyon. Cliff Ayres, Drake Cement's COO, planned on offering the audience a historical and geological overview of the site but strong winds were drowning out speakers and flapping the screen, so the y cut that out of the program. Cliff kindly provided me a set of his slides and handouts. The plants limestone quarry volumes are calculated for the Redwall's 20-ft thick "Crinoidal" and 95-ft thick "Oolitic" members. They calculate 89.23 million tons in the Oolitic member, with 53.86% CaO, 31.88 million tons in the Crinoidal member with 47.98% CaO, and another 30 million tons in a "Siliceous" layer that is not on their cross section, with 35.35% CaO. [bottom right, end of conveyor belt that brings limestone from the quarry in the background, to the storage building. My photo]. The engineers told us the limestone is running over 95% calcium, so they have to mix some "low calcium" limestone with it to have the right mix. Maybe one of you readers can explain the difference in numbers?? Considering plant production design is 660,000 tons per year, and the lime stone is mixed with other components, they say confidently that they have well over a hundred year's supply of raw materials lined up. Drake Cement is owned by Cementos Lima, the largest cement producer in Peru. The $300 million plant required over a decade to get permits and build, employing 600 construction workers. It has 55 employees now and will ramp up to 100 when they go into full production. One of the engineers told me they expect to ship about 60% of the plants output by rail on the nearby BNSF line, to Phoenix, Tucson, and Las Vegas. The company bought out two cement distributors in Las Vegas that are now branded as Drake Materials, to provide outlets for their type 2 and type 5 cements. 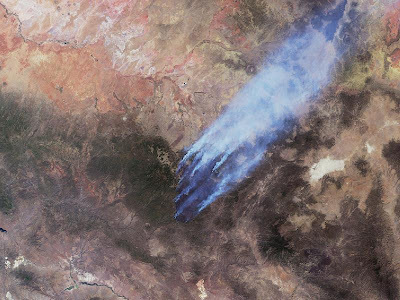 This image and description from NASA: The Moderate Resolution Imaging Spectroradiometer (MODIS) on the Aqua satellite acquired this image of the fires on June 15, 2011 at 20:30 UTC (4:30 p.m. EDT). Active fire areas appear as red dots, and smoke rises from the most intensely burning areas. NASA image courtesy Jeff Schmaltz, MODIS Rapid Response Team. Caption by Melissa Quijada. collectively expec ted to set a record of $245 million, driven in part by federal stimulus funds and some very large federal projects in carbon sequestration at a few surveys. Utah State Geologist Rick Allis presented a statistical summary at the AASG annual meeting in Dubuque yesterday. Total staffing at state surveys is about 2,060, a loss of about 1,000 since 1980. 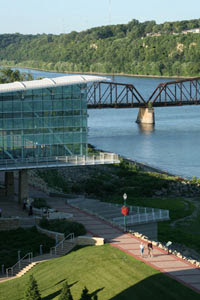 The 103rd AASG annual meeting got underway officially this morning on the banks of the Mississippi River in Dubuque, Iowa. 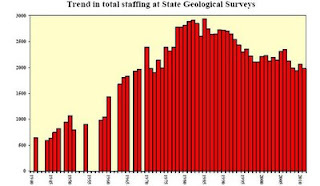 State geologists and staff are here from 38 states, along with a large number of representatives from federal agencies, professional societies, and other organizations. The highlight of the opening session is a forum on defending state geological surveys in a time of budget crises and trying to learn from each other. There are serious challenges facing many state geological surveys. Among the most dramatic changes coming is the Colorado survey being closed down in a year but they are looking at moving into a university. The Louisiana survey is proposed to phase out in 3 years. 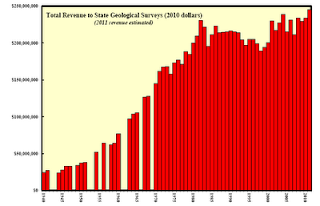 The Nevada survey is being rolled into the University of Nevada Department of Geosciences. State surveys overall are continuing a decades long shift from state funding to self funding with grants, contracts, and entrepreneurial funding sources. 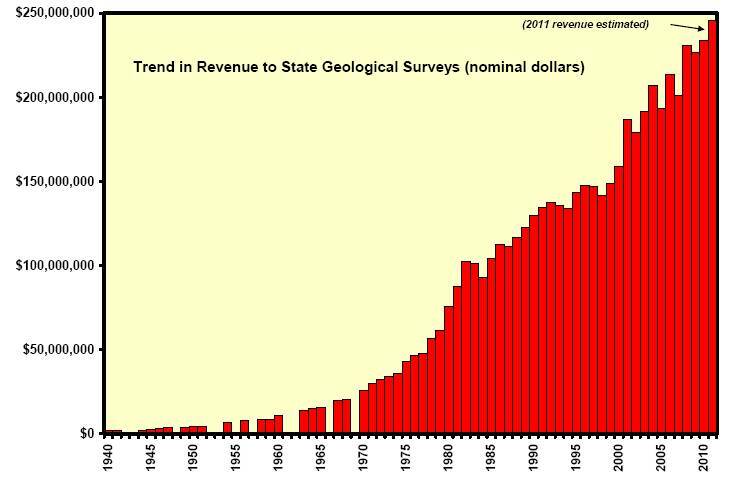 Total funding of state surveys nationwide will amount to about $250 million this year, but only about 40% of budgets come from state funds. The Arizona Geological Survey is getting about half that rate from the State of Arizona. According to a story from E&E News (subscription required), "The Environmental Working Group and Earthworks say BLM cited geologist Karen Wenrich in their evaluation of potential mining impacts on the Colorado River without disclosing that the scientist stands to benefìt from mining near the Grand Canyon." Karen is a co-author with AZGS Senior Geologist Jon Spencer on our recently released Breccia-pipe Uranium Mining in the Grand Canyon Region and Implications for Uranium Levels in Colorado River Water, (Open-file Report 11-04). The report documents the amount of uranium carried by the Colorado River from erosion of naturally-occurring processes. E&E News quotes BLM, "We understandably cited many of her publications, and at least one author had a conversation with her to clarify some things related to one or more of them. Dr. Wenrich was not a contractor for BLM, nor did she specifìcally perform any work on the EIS either paid or volunteer. 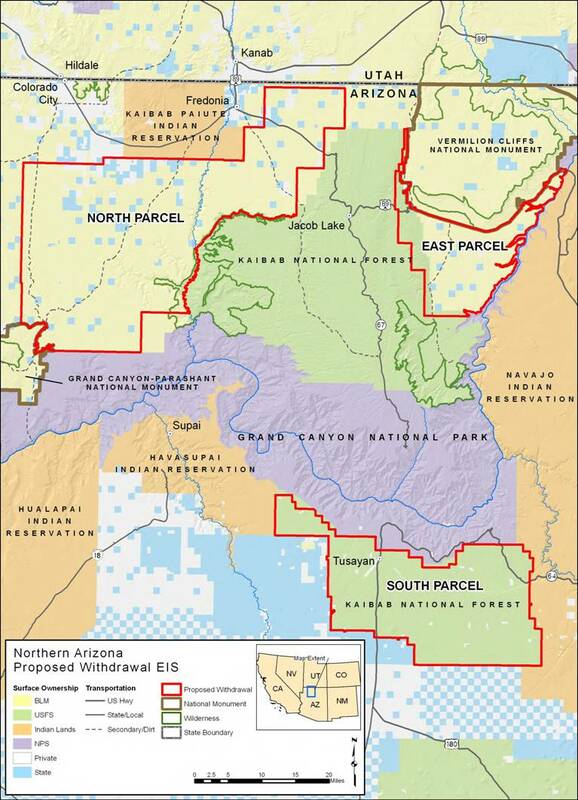 There has not been a 'relationship' between Dr. Wenrich and BLM in regards to the [Northern Arizonal Proposed Withdrawal ElS." We were aware of Karen's minerals activities in the region but found that they were irrelevant to the contributions she made in the study with Jon Spencer. Karen's role as a consulting geologist is identified prominentlyThe report went through internal and external peer review prior to release. The calculations in the study are simple and easily replicated by anyone with a calculator. We believe it provides valuable scientific evidence that addresses one of the main rationales for carrying out the EIS on 1 million acres of federal lands. We stand by the study. We flew over eastern Arizona on Sunday, on a commercial flight from Tucson to Chicago. The valleys were filled with thick white smoke that reminded us of coastal fog in California. We arrived at the State Geologists meeting in Dubuque last night and immediately heard from our colleagues in New Mexico just how bad affects of the smoke from multiple Arizona fires has been on visibility and breathing. the site into the surrounding native vistas." and Drainage District where it is blended with Central Arizona Project water to irrigate 5,000 acres of Arizona farmland. The company has delivered to date more than 1.6 billion gallons of water." The Horseshoe 2 fire containment is moving along and attention is turning to preparing for possible floods and debris flows in its aftermath. A public workshop is being organized for June 16, 6:30-8 pm (AZ time) in the Rodeo Community Center, just over the border in New Mexico. Technical assistance and other services from the Forest Service and Natural Resources Conservation Services will be discussed. Ann Youberg from AZGS (aka "Fire Girl") will describe debris flows and similar hazards and what can be done to mitigate them. Ann will be in the field with Forest Service experts next week to start the assessment of the Horseshoe 2 burned areas. Staff from Rep. Gabrielle Giffords office will also be on hand to provide information and answer questions about post-fire management and restoration. 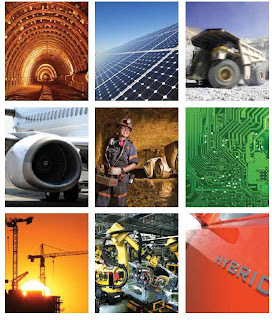 Materials forwarded by Thiago Antinori at the National Mining Association note that "the U.S. uses vast amounts of critical minerals to meet its needs in manufacturing, national security, product innovation and economic growth. Each year nearly $2 trillion is added to our domestic economy by major industries that use mineral materials, Yet despite vast reserves of key mineral resources, for nearly 20 years the U.S. has attracted an ever-declining share of worldwide investment in minerals exploration and is increasingly dependent upon imports to meet its needs. Growing demand for minerals worldwide, coupled with their strategic and economic importance underscore the need for policies that address our 21st century needs." -What is the role of minerals across the industrial supply chain? -How can metal mining projects act as catalysts for local economic development? 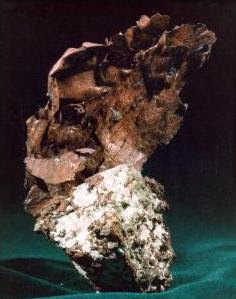 -What are the risks of dependence on mineral imports and how can this dependence be reversed? -What actions should be taken for the United States to foster investment in the sector and remain competitive? -Are the regulatory framework, the permitting process and the tax policies in place conducive to investment? You can watch it LIVE via the Minerals Make Life website. Also scheduled to testify, presumably in opposition, are Harrison Talgo, San Carlos Apache Tribe, Shan Lewis, President Inter Tribal Council of Arizona and Vice-Chairman Fort Mojave Indian Tribe, and Roger Featherstone, Arizona Mining Reform Coalition. Live streaming of the hearing will be available on the House Natural Resources Committee website. As the Horseshoe 2 fire is slowly contained in southern Arizona, residents are starting to prepare for post-fire flooding and debris flows. 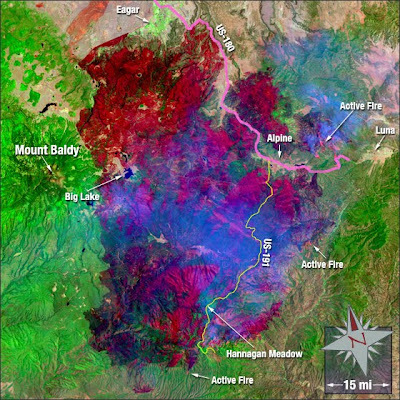 The 2010 Schultz Fire burned 6,091 hectares (15,051 acres) of Ponderosa Pine and mixed conifer forest, four kilometers (two and a half miles) north of Flagstaff, Arizona between June 20 and 30, 2010. Sixty-seven percent of the affected area burned at moderate to high intensity, destroying much of the vegetation and organic duff layer that previously covered the forest floor. The intensity of the fire, granular soils, and steep slopes made the burn area highly susceptible to the generation of debris flows and hyperconcentrated flows by runoff from intense summer monsoon storms common in the area. A magnitude 1.6 earthquake hit at 4 am on Thursday about 10 miles south of Colorado City, Arizona. near the Utah border. The time on the map at right is UTC rather than local time at the event. This is an area of active small earthquakes linked to the Intermountain Seismic Belt that extends into Utah. Other attendees included State Mine Inspector Joe Hart, Bob Quick, new executive director of the Arizona Mining Association, Steve Trussell, executive director of the Arizona Rock Products Association, Sydney Hay, head of AMIGOS, Rod Pace of Rosemont Copper, representatives of Freeport McMoRan, Asarco, Resolution Copper, CalPortland Cement, and numerous other companies. Sen. Melvin asked that the group form an Arizona Mining Alliance to show the clout of mining in state. Monthly meetings will be held in Tucson, with other organizations and companies being invited to join. Sen. Melvin bemoaned the amount of federal land in Arizona compared to Texas and eastern states, and called on the federal government to get out of the way on development of the Rosemont copper mine. Mary Poulton, head of the UA Dept. of Mining & Geologic Engineering, was featured speaker, explaining the role of mining in society, why Arizona is the number one mining state in the nation, and the role the university plays in mining research and education. 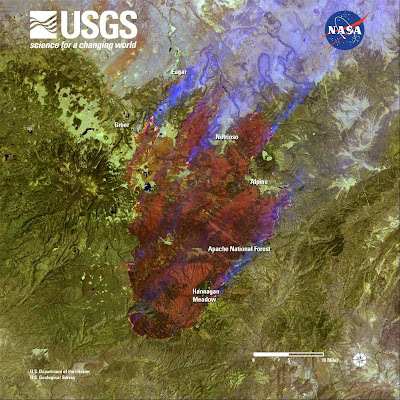 The USGS released this Landsat photo of the Wallow fire this afternoon. Just a heads up - the original is 10 Mb in case you want to download the original. There are other satellite photos at EarthSky.org. NASA’s Multi-angle Imaging SpectroRadiometer (MISR) instrument on the Terra spacecraft show the Wallow fire in eastern Arizona on June 7.